What a ride! 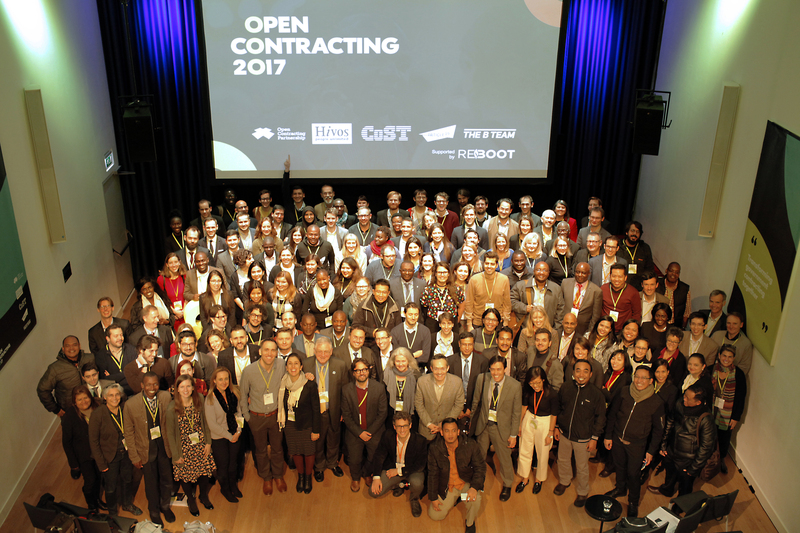 We’re still on a high from #OCGlobal17, our global gathering of open contracting innovators and champions. For the 200 people from over 37 countries who were with us in Amsterdam last week, we hope the two days left you inspired, energized and empowered. For those of you who couldn’t join us, we’d like to share some initial reflections on what we saw and learned. We’d also like to reflect on where we might all be heading next after this major milestone on the road to transforming public contracting with open data and user engagement. The three-story former warehouse, where we were gathered in Amsterdam, was buzzing with enthusiastic and smart people from every continent, different sectors, and diverse backgrounds. Everyone is coming to this with different experiences, passions, and ambitions across government, civil society, business and technology, and even varying views of what open contracting means. But #OCGlobal17 made one thing very clear – people are at the heart of this movement. Making open contracting the norm for governments everywhere depends on the conviction, willpower, determination and ingenuity of individuals to drive change and see it through – from Nigerian computer engineers creating user-friendly tools, to Paraguayan regulators setting better policies, Filipino journalists asking questions about contracting processes, British e-procurement experts recommending open contracting to clients, and Indonesian local government leaders meeting regularly with citizens to hear their feedback. There are others too, whom we need to bring into the conversation and work with better. School students in Colombia, village leaders in Uganda, hospital patients in Ukraine, e-procurement vendors in Taiwan and small business owners in Armenia. These are some of the real communities that matter not only as beneficiaries of better contracting but as changemakers who must be empowered if we are to shift the status quo truly. One of the high points of OCGlobal was hearing just how many pioneering bottom-up initiatives are budding around the globe without international organizations acting as catalysts. Members of the international community among us now need to nurture these grassroots projects and help them scale. We’re operating in challenging contexts. Political transitions threaten the sustainability of contracting reforms; civic space is contested and shrinking; populist movements are putting efforts to build public trust in jeopardy and systemic corruption and unethical business practices – some illicit, but many lawful – hold back markets. Succeeding in this environment requires strength in numbers and working smarter. 1. Open contracting is not only about procurement. Ultimately, it is about better social policies and delivery that matter to citizens’ lives. As our approaches, thinking, and models mature, they’re gaining a focus on connecting to broader conversations and reforms around governance, healthcare, education, access to information, business, financial secrecy: the list goes on. 2. We see the next wave of open contracting impact stories emerge. The Secretary of Education of Bogota, Colombia, shared her story of improving the city’s school food program through open contracting. In Paraguay, citizens have shown how to use open contracting data to hold their leaders to account. 3. Open contracting goes far beyond opening data, to opening systems and processes behind public spending and into long-term change in power structures. It soon gets into opening up beneficial ownership, company registers and asset declarations, to transparency in budgets and spending. 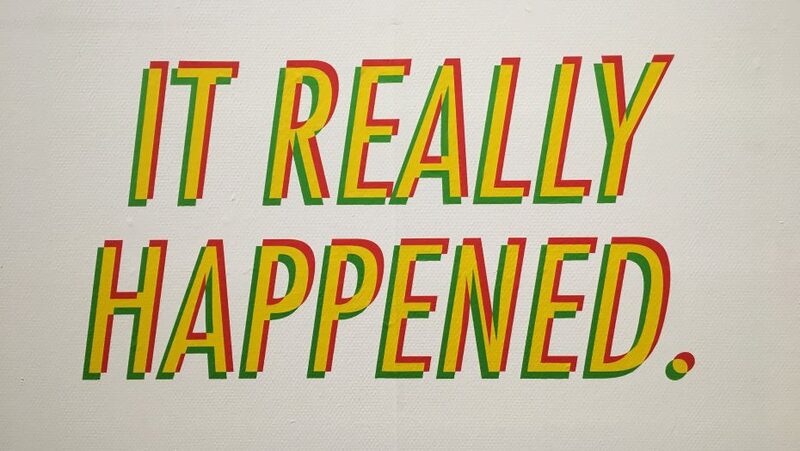 4. Business came up again and again. Importantly, we saw commitment to bring more private sector leadership onboard with the open contracting agenda, and concrete plans to take action at the country level, with a pilot private sector project in Kenya, announced by the B Team. Working in collaboration with Invest in Africa, Hivos, the World Economic Forum, Safaricom and other partners, the B Team plans to mobilize private sector support for open contracting in Kenya, recruiting a group of companies to develop and promote leadership practices, like those of the African Partner Pool that enables easier and more transparent access to opportunities for SMEs. We will also work to bring the private sector to contribute to the development of Kenya’s OGP National Action Plan and involve Kenya company partners in the long-term research project on the concrete benefits of open contracting to governments and the private sector. At the global level, we will continue to take the ideas from this field into spaces where the private sector is already at work on related issues—such as e-procurement and the future of urban services in the long term. Business leaders, the B Team and a wide array of open contracting practitioners are expanding the conversation around deeper accountability and transformation of these systems to serve people better and deliver much more competitiveness and access for business. And lastly, we’ll keep finding stories of where business is leading or innovating, including in their supply chain and procurement, bringing those examples into the conversation, both at the policy level and into our field. For example, the International Association for Contract and Commercial Management (IACCM) has offered to provide free access to its contract management course to procurement agencies in countries working to improve their contracting systems. 5. Iterate, improve and stay credible. 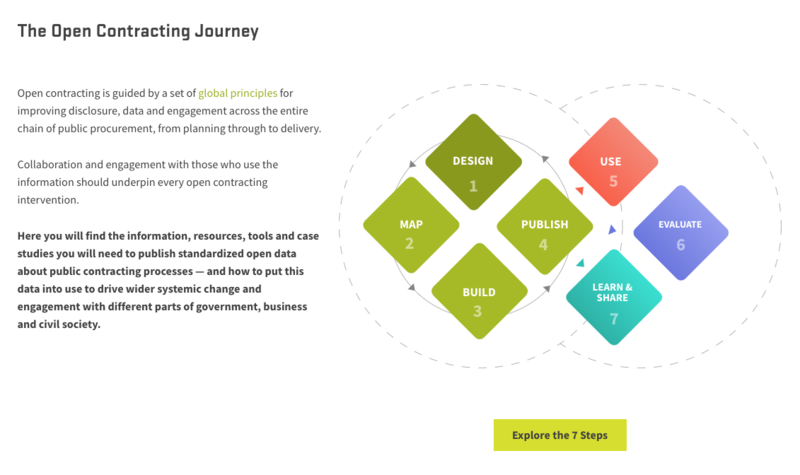 Open contracting is an iterative process: you can conceptualize it across seven repeat steps to publishing open data, creating impact and measuring it. People were at very different stages of the journey at #OCGlobal17, and there was a real hunger for tools and assistance. We are keen to move partners beyond transparency for transparency’s sake toward delivering real, tangible value from open contracting data. Our new use case research and guidance take some first steps toward better defining the path between data and outcomes. Data quality over quantity has been a recurring theme. We need to do more to check and validate the data to avoid open contracting becoming mere open-washing. We also need to tighten up some of the language around open contracting, especially across multiple languages. You can read more of the latest thinking on these here. We will publish the full feedback once we have collated it but our quick assessment shows over 50% of attendees said the event exceeded or greatly exceeded their expectations and another 40% said that it met expectations. Many of you praised the open and participatory approach to the sessions tailored to the needs of the participants, with lots of opportunities for meaningful conversation. Big thanks here to our brilliant design and facilitation team from the social enterprise Reboot. There are also things that we can do better next time. Our agenda was simply too ambitious for two days – you wanted more downtime and more unstructured space. The ecosystem mapping exercise worked well for some but not others. People liked the hard talk, collaboration coffees, and skeptical sessions, but wanted more time to dive deep into specific issues, tools and more examples from countries. And it wasn’t only the participants who wanted more space to share and collaborate: we could have done with it as organizers! It’s not too late to fill out the post-conference survey, and we will be sharing a more detailed discussion about our lessons learned as organizers once the full survey results are in. For all of us organizers, this conference has been incredibly useful to understand where everyone is at and how to support you better through materials and guidance documents. The rich conversations, meetings, and outputs will shape our organizational strategies to come. We’ve also seen new partnerships and a great number of nascent ideas emerging in the design lab sessions alone, from a fellowship for journalists to a new “Food for Thought Alliance.” We are looking forward to further exploring these together with you over the coming months. Although there won’t be an OCGlobal18, we will be getting together at major regional and global events – such as the G20, the OGP Summit, the International Open Data Conference, and the International Anti-Corruption Conference. We hope you and other key stakeholders will join us there. The European Commission earmarking several million euros for the extension of procurement reporting to contracting registers including support for use Open Contracting Data Standard over the next two years. The European Bank for Reconstruction and Development working with their government partners with a vision to expanding the Contracting 5 (now Contracting 6, welcome Argentina!) to a Contracting ten next year to foster best practice innovation and learning. Clean Contracting Manifesto – a collective action for tackling corruption in contracting launched by Transparency International, Hivos, CoST, Article 19 and the OCP. Add your voice and action to the manifesto as well. Taking lessons learned from the London Olympics to push for greater transparency, accountability, and efficiency in the huge sums that will be spent on infrastructure and services for the Paris Summer Olympics in 2024. New data: Nepal is now publishing open contracting data for the first time, and Paraguay has fully integrated its spending data. DIGIWHIST is working on publishing contracting data from the EU into the OCDS. We know many of you are working on these, keep at it and let us know. OpenOpps offered to help countries in transforming their data to the Open Contracting Data Standard. In Latin America, an open contracting working group, hosted by the Latin American Network for Government Procurement in collaboration with ILDA, Hivos, and the OCP and financed by the IDRC, will bring the region’s public procurement agencies together. The CoST Secretariat will be developing a specific infrastructure profile of the Open Contracting Data Standard based on their existing guidance. There will be a new round of innovation challenges run by Hivos and the OCP with a specific focus on countries and regions where data is not readily available. In closing, let’s keep in mind the words of OGP’s Sanjay Pradhan, who kicked off OCGlobal17 with a heartfelt reflection on the impact of contracting in his own life. The success of open contracting relies on 1) compelling results, 2) sustained coalitions for change and 3) courageous and committed leadership to persevere through the formidable odds, and deliver on the promise and the energy of open contracting over the coming years. After last week we are more energized than ever to achieve these three touchstones with you! All of us collectively are the heart of open contracting, and we can’t wait to see how we can power the field together.